Doula vs. Midwife: What is the difference? Becoming a new mom can sometimes be overwhelming. Whether it’s your first baby or your fifth, every new mom needs a helping hand to get through labor and delivery, and adjusting to having a newborn at home. Luckily, for every mom there are two different experts who she can turn to for help in transitioning from pregnancy to motherhood. Doulas and midwives are trained professionals who serve in different capacities to help a mother make the transition. While a common misconception is that both professions perform similar duties, doulas and midwives actually aren’t that similar as they have different training, duties to carry out, and certifications. A doula is someone who acts essentially as the expectant mother’s best friend. Both the expectant mother and the doula will develop a bond long before the baby is expected, and plan how the expectant mother would like her birthing experience to go. The expectant mother will also be able to ask her doula, any questions about labor and delivery that she might have. There are two different types of doulas: birth doulas and postpartum doulas. While both types of doulas are meant to act as support, they have different roles that they play. A birth doula, also known as a labor doula, will be by your side offering nonmedical advice and techniques. A birth doula is trained in helping a laboring mother with breathing, providing massages, and helping to move you into different body positions to ensure that you are as comfortable as possible. Birth doulas can also provide emotional support and act as an advocate on your behalf to ensure that you have the birthing experience that you want and have previously discussed. No matter what type of birth you have, your doula will be there to help you feel safe and empowered. Your doula will support you in whatever decisions that you make surrounding your birthing experience. If you decide to have a natural birth or use the assistance of medication to help you through, your doula will be there to support you. If you end up having an unplanned cesarean, your doula can help to comfort you and give you the extra attention that you’ll need to alleviate your fears and anxieties about the procedure. Reports have shown that expectant mothers who have the assistance of a doula report less need for medical intervention during the course of labor and delivery. It is important to note that a doula is not a substitute for a doctor or a midwife since they do not receive the same in-depth medical training. Having a postpartum doula can be a valuable addition, especially if there are other children in the home. A postpartum doula can help a new mother as she is recovering from the birthing process. 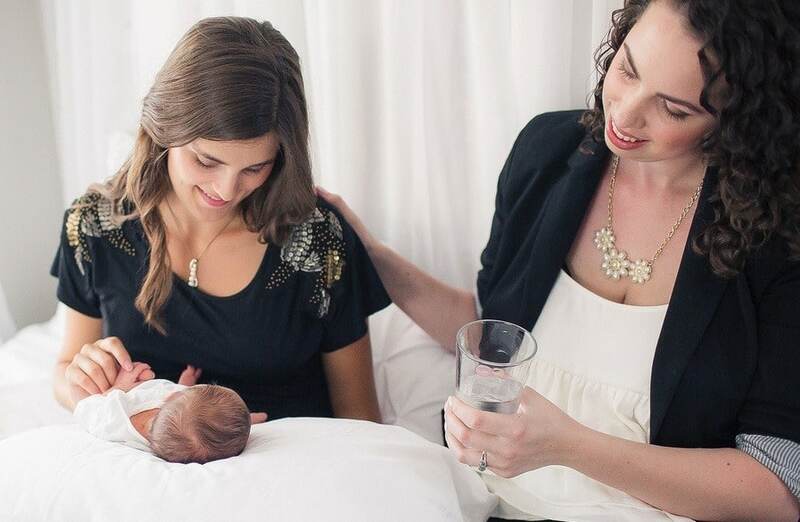 A doula assists by caring for the newborn and guiding a new mother through the breast-feeding process. To become a doula, all must go through a certification process. The certification process will include didactic training, and assisting during live births. Certification requirements will vary from state to state and can be obtained through International Doula Institute. A midwife is a man or woman who has received professional medical training. A certified nurse-midwife can do many of the same things that a doctor can do, such as, perform gynecological exams, provide prenatal care, administer pain medications, give labor inducing drugs, monitor the fetus using electronic equipment, perform episiotomies and stitch tears. Midwife care centers promote natural births, while detecting complications during labor, and use emergency measures when needed. A certified midwife is authorized to work in a variety of settings, including health clinics, hospitals or in the home for home births. Similar to doulas, a midwife’s certification requirements will vary from state to state. All midwives must go through specific education and training, have supervised clinical experience, and complete all the requirements for certification that are set forth by the Midwifery Education Accreditation Council. In the United States, a midwife must be certified through the North American Registry of Midwives and the American Midwifery Certification Board. Many midwives in the United States are also registered nurses, and are called Certified Nurse-Midwives (CNM), and have a bachelor’s degree from an accredited institution as well as certification from the American College of Nurse Midwives. Because a doula and a midwife are two different professions that offer different benefits to expectant mothers, you don’t have to choose to only have one to help you during the process of labor and delivery. If you are wanting to have a home birth, you’ll want to have at least a midwife there for their medical training. Speak to your delivery team to learn more about what is a doula and if you should include one as part of your birthing team. A doula can prove to be a valuable addition to your birthing team if you are a new mother, or if you are wanting to have additional emotional support throughout the process.